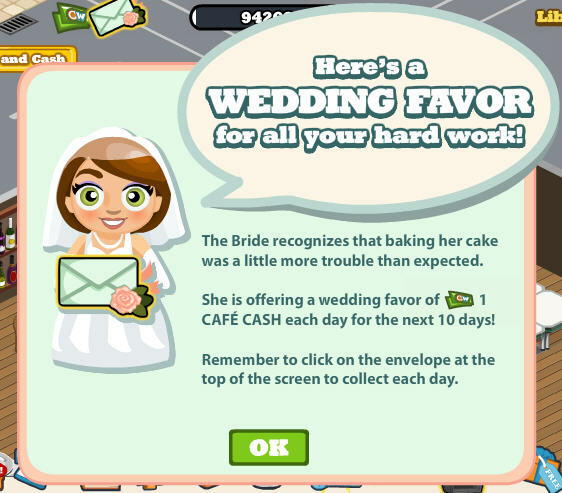 A few weeks ago, every Cafe World player encountered a teary-eyed bride who needed help baking a wedding cake. Then, after we bugged friends to send us the require ingredients for this mega cake, nothing happened. The cake just sat around, and the bride never picked it up. Or, we'd add ingredients to the wedding cake and come back the next day to find that they had mysteriously disappeared again. Well, looks the complaints were heard, and Zynga's offering a consolation prize for PO'd bakers -- free Cafe Cash. When you login to Cafe World over the next 10 days, click the envelope at the top of the screen to earn 1 Cafe Cash at a time. We're not sure if a little Cafe Cash will quell the angry masses, but it's at least a move in the right direction.